I'm so glad Henry is doing well. If the skin is not raised or different in some other way, I would not be concerned with the color change. Do you think it could be a "liver spot?" He has a very, very good look about him. His eyes are alert and happy. I'm very excited he's doing so well. He's a lucky old man to have found such a loving home and wonderful vet. 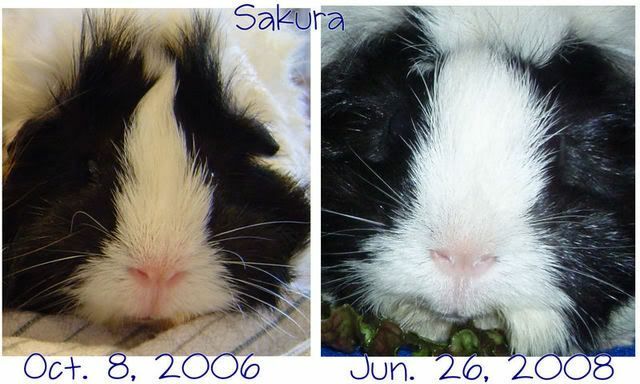 Sakura has some pigment changes on either side of her nose. She is 2.5 years old now. The skin isn't raised. It is just a change in pigment, and as you can see, it matches the little spots on his tummy side. Well, good. I'm glad it's not something to worry about! Doodle has developed a little black patches on either side of her nose, too. They look very similar to Henry's. I wonder if this might be a fairly common occurrence as pigs age. I just wanted to report that Henry has continued to gain weight. He's perky and happy and marking his territory. We've noticed that between 8 and 12 hours of taking his actigall, he kicks out some sludge. Other than that, he seems to be doing well. We've been stepping him down on the vetprofen, so he should be off of that soon. Good news about Henry. Yah, go Henry. That's interesting about the actigall. Thanks for the update! Yes, great news about Henry! Glad to hear he is recovering fine. That is good news. Hugs to Mr Henry. Yay for Henry! So glad he's doing well. That's great news. It's also interesting about the Actigall moving sludge. Does it increase thirst? A few nights ago, I noticed that Henry kicked out some sludge and also something I'm referring to as "stone flakes," because they appear to be made out of the same material as bladderstones and yet they're thin little pieces, not unlike fish food or fish flakes. In this picture, the magenta arrow is pointing to sludge, and the blue arrows are pointing to some of the stone flakes. He has been eating his hay, drinking, eating pellets, and otherwise acting pretty normal. The only thing off - and we've noticed this will all of our intact boys when they're having bladder issues - is that when he stood on all four feet, he would hold his testicles out behind him a little. Well, tonight, I went downstairs to check on him, and he ran to the side of the cage, but his front feet on the grids, and wheeked at me. 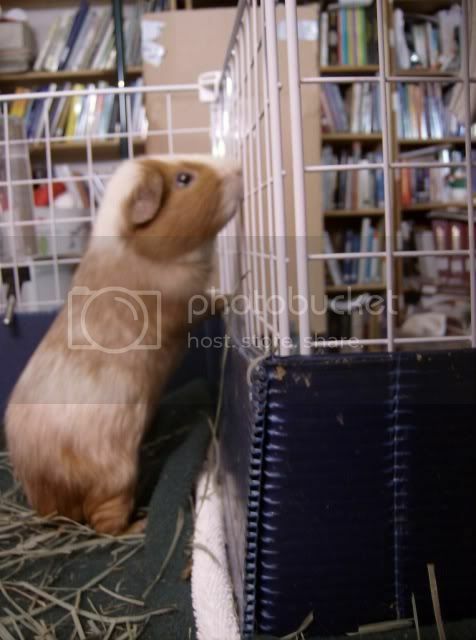 When I went over to the cage, he ran to his pigloo, in and out of it, until I picked it up to see what was going on. Inside, I found a stone, a little smaller than a peppercorn. I am wondering if the actigall chipped out pieces of the stone until it was small enough for him to pass? I will mention that all of this time, Henry has continued to gain weight, so this stone hasn't really bothered him very much. Sorry the pictures are so out of focus. Henry looks great! It is wonderful that he was able to pass a stone! Henry is one amaazing pig! I love the picture of him begging at the bars. That is adorable. He really IS an amazing pig. 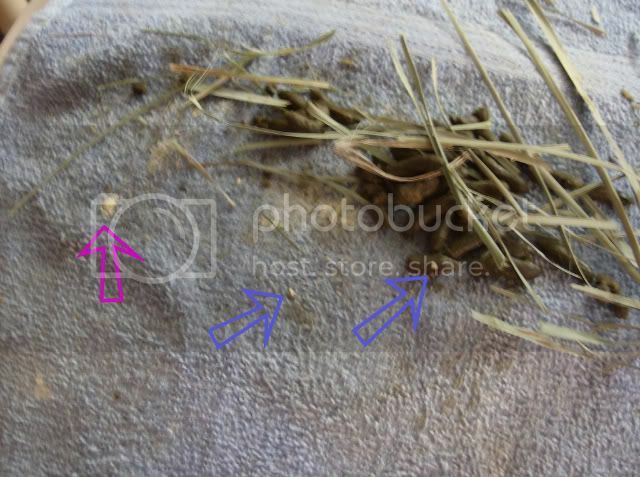 I've also noticed Piggy sometimes has white flake/spot looking areas in his poo. He's a stone pig with lots of calcium in his urine but isn't on actigal.